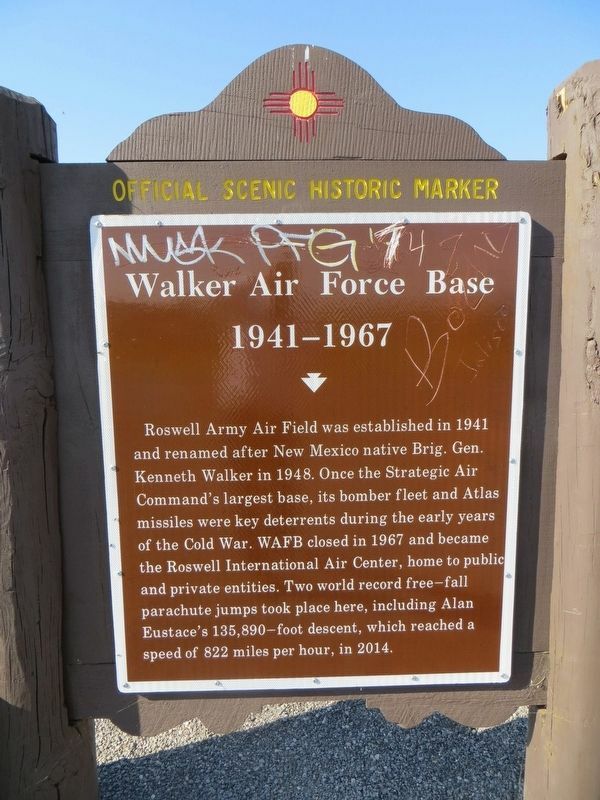 Roswell Army Air Field was established in 1941 and renamed after New Mexico native Brig. Gen. Kenneth Walker in 1948. Once the Strategic Air Command’s largest base, its bomber fleet and Atlas missiles were key deterrents during the early years of the Cold War. WAFB closed in 1967 and became the Roswell International Air Center, home to public and private entities. Two world record free-fall parachute jumps took place here, including Alan Eustace’s 135,890-foot descent, which reached a speed of 822 miles per hour, in 2014. Location. 33° 19.838′ N, 104° 30.415′ W. Marker is in Roswell, New Mexico, in Chaves County. Marker is at the intersection of Relief Route and South Main Street (U.S. 285), on the right when traveling east on Relief Route. Touch for map. 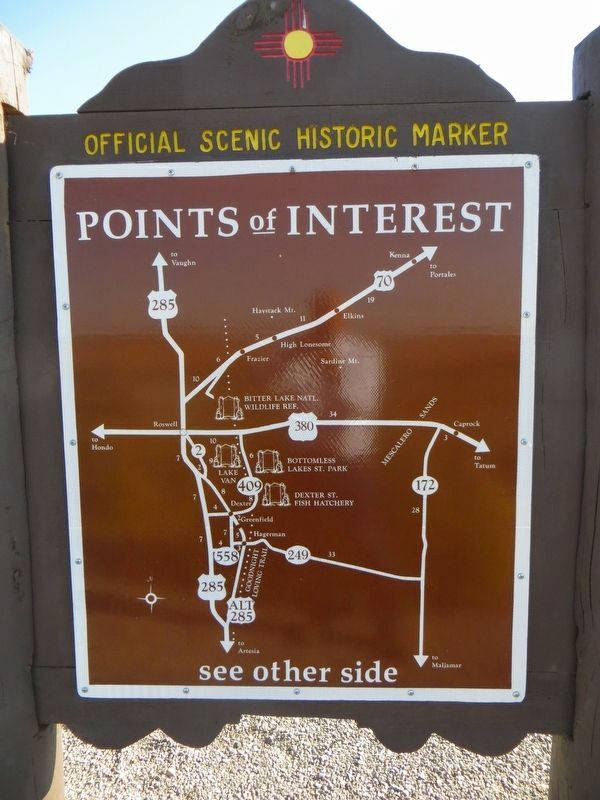 Marker is located at a pull-out on the south side of the road, west of US 285. Marker is in this post office area: Roswell NM 88203, United States of America. Touch for directions. (approx. 4.7 miles away); a different marker also named Roswell (approx. 4.7 miles away); Roswell’s First General Store and Post Office (approx. 4.7 miles away); Patrick Floyd Jarvis Garrett (approx. 4.7 miles away); Chaves County Court House (approx. 4.7 miles away); Justice in the Wild West (approx. 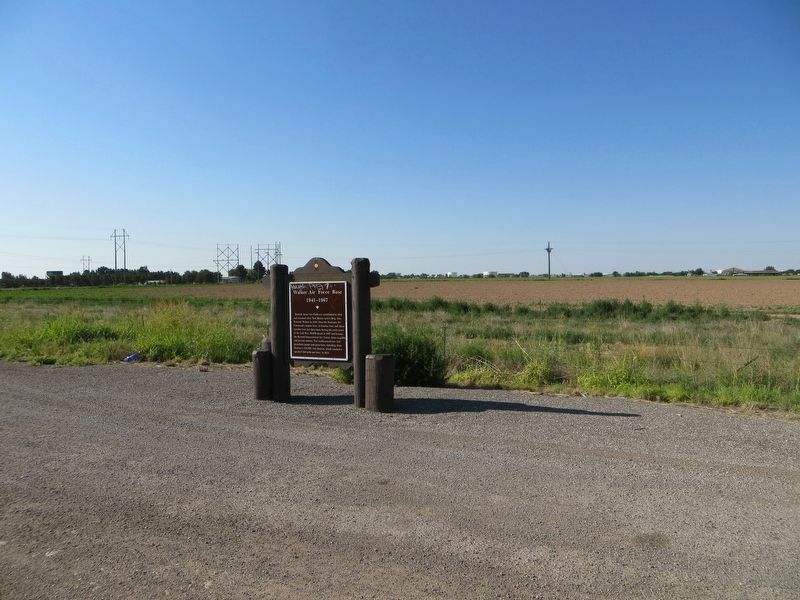 4.7 miles away); Chaves County Veterans War Memorial (approx. 4.7 miles away). Touch for a list and map of all markers in Roswell. More. Search the internet for Walker Air Force Base. Credits. This page was last revised on July 6, 2018. This page originally submitted on June 15, 2017, by Bill Kirchner of Tucson, Arizona. This page has been viewed 169 times since then and 31 times this year. Last updated on July 6, 2018, by Brian Anderson of Kingwood, Texas. Photos: 1, 2, 3. submitted on June 15, 2017, by Bill Kirchner of Tucson, Arizona. • Syd Whittle was the editor who published this page.